I plan to run supervised ADMIXTURE for the same database as in K15 but with fixed components. For Europe and other regions I want to include rather contrast population not transitional like some Central Euro or Central Asian... I think it doesn't have much sense. Do you think such references would be good? Maybe add someting more? Last edited by BalkanKiwi; 02-01-2018 at 08:41 PM. For this test, do I need to send you raw data, or give you my K36 scores? Rawdata, but I want to talk with Gedmatch guys, about K15 World also, to add it. Sounds very interesting, looking forward to seeing it. Łukasz, I am wondering how are you going to cover Spain, France and Germany. I guess Spain can be partially covered by Basque. France by Insular-Celtic, Scando-Germanic and maybe Sardinian. What about Germany? Is it close enough to Sweden and Norway? I guess your references look reasonable. I guess West Germany will be 1/3 Celtic, 1/3 Germanic, and the rest between Basque and Sardinian. East Germany about half Slavic with some Baltic, the rest with bigger Germanic than Celtic. Of course some Basque/Sardinian could be also but I can't guess how much. I wouldn't use Maasai and Hadza for the East African component, as they are recently mixed groups. I would rather go with separate Sudanese/Nilotic (based on South Sudanese samples, Dinka and the like) and Omotic (Ari) components. 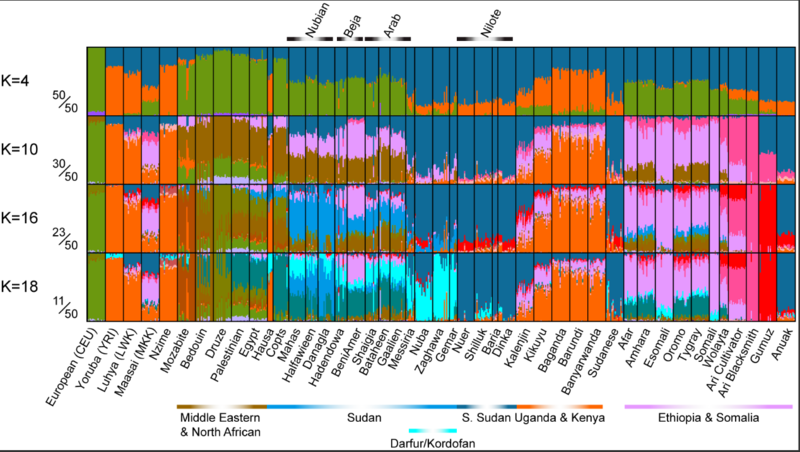 There is ancient West African and West Eurasian, respectively, in these groups, but they are the best available representatives of the pre-Neolithic natives of Sudan and Ethiopia (Mota represents the latter but that's a lone sample, and he shares a lot of drift with Ari). If you want to, you could also add Somalis for a separate Cushitic component since based on the Tanzania Luxmanda 3100 BP sample, they are relatively similar to the pastoralists who migrated to southeastern and southern Africa. Looks great, if you could have a "Sahelian" component that'd be amazing (Zagawa, Gemar). It peaks among Darfurians and is significant among northern Sudanese pops; I'd imagine it'll be equally significant among Chadic speakers once their samples are tested. Last edited by NiloSaharan; 11-27-2017 at 09:09 PM. When it's up and running could you please do mine? You have my raw data.